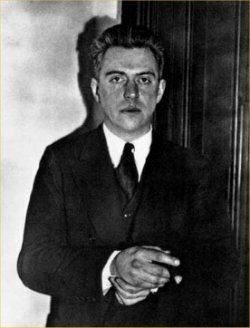 It’s the death day of Hart Crane, who passed away seventy-eight years ago on April 27, 1932. Hart Crane committed suicide. But it was a cheery suicide, as suicides go. Even if the consequences leading up to the suicide were bizarre and far from happy. You have to credit Crane for his courtesy in shouting “Goodbye, everybody!” to a crowd before throwing himself off a steamship into the Gulf of Mexico. I mean, how many of the hundreds of people who have thrown themselves off the Golden Gate Bridge have managed to even do that? The Dead Writer’s Almanac staff has conducted an informal poll, and it seems that people who shout “Goodbye, everybody!” just before leaping to their needless deaths are now considered exhibitionists who rely upon some crude cry for attention, the equivalent to that annoying guy at the party who complains about the lackluster canapes and the diminishing liquor supply. Suicide victims are now expected to leap to their deaths with a stoic resolve. No commentary. Just the self-immolation itself. But that seems needlessly limited when you’re a talented American poet. In any event, this suicide arose after poor Crane was beaten just after attempting to proposition several officers. An even more bizarre element concerns his fiancee, Peggy Baird, who had just experienced a freak accident involving an exploding cigarette lighter. With his fiancee bandaged and sedated aboard the cruise ship. it was small wonder that the sexually confused Crane plied himself up with liquor and made bold barebacking suggestions to the ship’s crew. But we can proud report that Jasper Johns, who was greatly inspired by Crane for a great number of his works, is not yet dead. (Hi, Jasper! Keep painting that canvas!) It is also quite possible to celebrate Crane without being compelled to mimic his exuberant demise. It’s always a good day for poetry. Just be sure that your loved one doesn’t screw around with a lighter on the fritz. Stay writing, don’t die too early, and keep in touch! John Berryman waved before he jumped from the Washington Avenue bridge, so maybe it’s a poetical thing? We need a few more poetical suicides before we’ll know for sure. Perhaps the NEA should fund a study. Wow, I’d never even heard the story of Crane’s suicide. Wild.